Electric charge is the physical property of matter that causes it to experience a force when placed in an electromagnetic field. There are two-types of electric charges; positive and negative (commonly carried by protons and electrons respectively). Like charges repel and unlike attract. An object with an absence of net charge is referred to as neutral. Early knowledge of how charged substances interact is now called classical electrodynamics, and is still accurate for problems that do not require consideration of quantum effects. Electric charge is a conserved property; the net charge of an isolated system, the amount of positive charge minus the amount of negative charge, cannot change. Electric charge is carried by subatomic particles. In ordinary matter, negative charge is carried by electrons, and positive charge is carried by the protons in the nuclei of atoms. 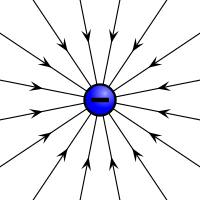 If there are more electrons than protons in a piece of matter, it will have a negative charge, if there are fewer it will have a positive charge, and if there are equal numbers it will be neutral. Charge is quantized; it comes in integer multiples of individual small units called the elementary charge, e, about 6981160200000000000♠1.602×10−19 coulombs, which is the smallest charge which can exist freely (particles called quarks have smaller charges, multiples of 1/3e, but they are only found in combination, and always combine to form particles with integer charge). 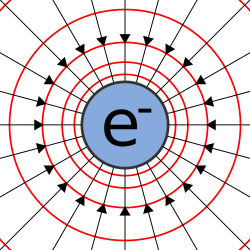 The proton has a charge of +e, and the electron has a charge of −e. 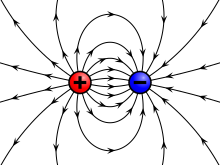 An electric charge has an electric field, and if the charge is moving it also generates a magnetic field. The combination of the electric and magnetic field is called the electromagnetic field, and its interaction with charges is the source of the electromagnetic force, which is one of the four fundamental forces in physics. The study of photon-mediated interactions among charged particles is called quantum electrodynamics. The SI derived unit of electric charge is the coulomb (C) named after French physicist Charles-Augustin de Coulomb. In electrical engineering, it is also common to use the ampere-hour (Ah); in physics and chemistry, it is common to use the elementary charge (e as a unit). Chemistry also uses the Faraday constant as the charge on a mole of electrons. The symbol Q often denotes charge. From ancient times, persons were familiar with four types of phenomena that today would all be explained using the concept of electric charge: (a) lightning, (b) the torpedo fish (or electric ray), (c) St Elmo's Fire, and (d) that amber rubbed with fur would attract small, light objects. The first account of the amber effect is often attributed to the ancient Greek mathematician Thales of Miletus, who lived from c. 624 – c. 546 BC, but there are doubts about whether Thales left any writings; his account about amber is known from an account from early 200s. This account can be taken as evidence that the phenomenon was known since at least c. 600 BC, but Thales explained this phenomenon as evidence for inanimate objects having a soul. In other words, there was no indication of any conception of electric charge. More generally, the ancient Greeks did not understand the connections among these four kinds of phenomena. The Greeks observed that the charged amber buttons could attract light objects such as hair. They also found that if they rubbed the amber for long enough, they could even get an electric spark to jump, but there is also a claim that no mention of electric sparks appeared until late 17th century. This property derives from the triboelectric effect. In late 1100s, the substance jet, a compacted form of coal, was noted to have an amber effect, and in the middle of the 1500s, Girolamo Fracastoro, discovered that diamond also showed this effect. Some efforts were made by Fracastoro and others, especially Gerolamo Cardano to develop explanations for this phenomenon. In contrast to astronomy, mechanics, and optics, which had been studied quantitatively since antiquity, the start of ongoing qualitative and quantitative research into electrical phenomena can be marked with the publication of De Magnete by the English scientist William Gilbert in 1600. In this book, there was a small section where Gilbert returned to the amber effect (as he called it) in addressing many of the earlier theories, and coined the New Latin word electrica (from ἤλεκτρον (ēlektron), the Greek word for amber). The Latin word was translated into English as electrics. Gilbert is also credited with the term electrical, while the term electricity came later, first attributed to Sir Thomas Browne in his Pseudodoxia Epidemica from 1646. (For more linguistic details see Etymology of electricity.) Gilbert hypothesized that this amber effect could be explained by an effluvium (a small stream of particles that flows from the electric object, without diminishing its bulk or weight) that acts on other objects. This idea of a material electrical effluvium was influential in the 17th and 18th centuries. It was a precursor to ideas developed in the 18th century about "electric fluid" (Dufay, Nollet, Franklin) and "electric charge." Around 1663 Otto von Guericke invented what was probably the first electrostatic generator, but he did not recognize it primarily as an electrical device and only conducted minimal electrical experiments with it. Other European pioneers were Robert Boyle, who in 1675 published the first book in English that was devoted solely to electrical phenomena. His work was largely a repetition of Gilbert's studies, but he also identified several more "electrics", and noted mutual attraction between two bodies. In 1729 Stephen Gray was experimenting with static electricity, which he generated using a glass tube. He noticed that a cork, used to protect the tube from dust and moisture, also became electrified (charged). Further experiments (e.g, extending the cork by putting thin sticks into it) showed – for the first time – that electrical effluvia (as Gray called it) could be transmitted (conducted) over a distance. Gray managed to transmit charge with twine (765 feet) and wire (865 feet). Through these experiments, Gray discovered the importance of different materials, which facilitated or hindered the conduction of electrical effluvia. John Theophilus Desaguliers, who repeated many of Gray’s experiments, is credited with coining the terms conductors and insulators to refer to the effects of different materials in these experiments. Gray also discovered electrical induction (i.e., where charge could be transmitted from one object to another without any direct physical contact). For example, he showed that by bringing a charged glass tube close to, but not touching, a lump of lead that was sustained by a thread, it was possible to make the lead become electrified (e.g., to attract and repel brass filings). He attempted to explain this phenomenon with the idea of electrical effluvia. Gray’s discoveries introduced an important shift in the historical development of knowledge about electric charge. The fact that electrical effluvia could be transferred from one object to another, opened the theoretical possibility that this property was not inseparably connected to the bodies that were electrified by rubbing. In 1733 Charles François de Cisternay du Fay, inspired by Gray's work, made a series of experiments (reported in Mémoires de l'Académie Royale des Sciences), showing that more or less all substances could be 'electrified' by rubbing, except for metals and fluids and proposed that electricity comes in two varieties that cancel each other, which he expressed in terms of a two-fluid theory. When glass was rubbed with silk, du Fay said that the glass was charged with vitreous electricity, and, when amber was rubbed with fur, the amber was charged with resinous electricity. Another important two-fluid theory from this time was proposed by Jean-Antoine Nollet (1745). In 1839, Michael Faraday showed that the apparent division between static electricity, current electricity, and bioelectricity was incorrect, and all were a consequence of the behavior of a single kind of electricity appearing in opposite polarities. It is arbitrary which polarity is called positive and which is called negative. Positive charge can be defined as the charge left on a glass rod after being rubbed with silk. Up until about 1745, the main explanation for electrical attraction and repulsion was the idea that electrified bodies gave off an effluvium.Benjamin Franklin started electrical experiments in late 1746, and by 1750 had developed a one-fluid theory of electricity, based on an experiment that showed that a rubbed glass received the same, but opposite, charge strength as the cloth used to rub the glass. Franklin imagined electricity as being a type of invisible fluid present in all matter; for example, he believed that it was the glass in a Leyden jar that held the accumulated charge. He posited that rubbing insulating surfaces together caused this fluid to change location, and that a flow of this fluid constitutes an electric current. He also posited that when matter contained too little of the fluid it was negatively charged, and when it had an excess it was positively charged. For a reason that was not recorded, he identified the term positive with vitreous electricity and negative with resinous electricity. William Watson independently arrived at the same explanation at about the same time (1746). After Franklin's work, effluvia-based explanations were rarely put forward. It is now known that the Franklin–Watson model was fundamentally correct. There is only one kind of electrical charge, and only one variable is required to keep track of the amount of charge. Until 1800 it was only possible to study conduction of electric charge by using an electrostatic discharge. In 1800 Alessandro Volta was the first to show that charge could be maintained in continuous motion through a closed path. ^ a b "CIPM, 1946: Resolution 2". BIPM. ^ Gambhir, RS; Banerjee, D; Durgapal, MC (1993). Foundations of Physics, Vol. 2. New Dehli: Wiley Eastern Limited. p. 51. ISBN 9788122405231. Retrieved 10 October 2018. ^ Carron, Neal J. (21 May 2015). "Babel of units: The evolution of units systems in classical electromagnetism". p. 5. arXiv:1506.01951 [physics.hist-ph]. ^ Purcell, Edward M.; David J. Morin (2013). Electricity and Magnetism (3rd ed.). Cambridge University Press. p. 766. ISBN 9781107014022. ^ Roller, Duane; Roller, D.H.D. (1954). The development of the concept of electric charge: Electricity from the Greeks to Coulomb. Cambridge, MA: Harvard University Press. p. 1. ^ O'Grady, Patricia F. (2002). Thales of Miletus: The Beginnings of Western Science and Philosophy. Ashgate. p. 8. ISBN 978-1351895378. ^ Roller, Duane; Roller, D.H.D. (1953). "The Prenatal History of Electrical Science". American Journal of Physics. 21 (5): 348. Bibcode:1953AmJPh..21..343R. doi:10.1119/1.1933449. ^ Roller, Duane; Roller, D.H.D. (1953). "The Prenatal History of Electrical Science". American Journal of Physics. 21 (5): 351. Bibcode:1953AmJPh..21..343R. doi:10.1119/1.1933449. ^ Roller, Duane; Roller, D.H.D. (1953). "The Prenatal History of Electrical Science". American Journal of Physics. 21 (5): 353. Bibcode:1953AmJPh..21..343R. doi:10.1119/1.1933449. ^ a b Roller, Duane; Roller, D.H.D. (1953). "The Prenatal History of Electrical Science". American Journal of Physics. 21 (5): 356. Bibcode:1953AmJPh..21..343R. doi:10.1119/1.1933449. ^ Roche, J.J. (1998). The mathematics of measurement. London: The Athlone Press. p. 62. ISBN 978-0387915814. ^ Roller, Duane; Roller, D.H.D. (1954). The development of the concept of electric charge: Electricity from the Greeks to Coulomb. Cambridge, MA: Harvard University Press. p. 6–7. ^ Brother Potamian; Walsh, J.J. (1909). Makers of electricity. New York: Fordham University Press. p. 70. ^ Baigrie, Brian (2007). Electricity and magnetism: A historical perspective. Westport, CT: Greenwood Press. p. 11. ^ Heathcote, N.H. de V. (1950). "Guericke's sulphur globe". Annals of Science. 6 (3): 304. doi:10.1080/00033795000201981. Heilbron, J.L. (1979). Electricity in the 17th and 18th centuries: a study of early Modern physics. University of California Press. pp. 215–218. ISBN 0-520-03478-3. ^ a b Baigrie, Brian (2007). Electricity and magnetism: A historical perspective. Westport, CT: Greenwood Press. p. 20. ^ Baigrie, Brian (2007). Electricity and magnetism: A historical perspective. Westport, CT: Greenwood Press. p. 21. ^ a b Baigrie, Brian (2007). Electricity and magnetism: A historical perspective. Westport, CT: Greenwood Press. p. 27. ^ Baigrie, Brian (2007). Electricity and magnetism: A historical perspective. Westport, CT: Greenwood Press. p. 28. ^ Heilbron, J.L. (1979). Electricity in the 17th and 18th Centuries: A Study of Early Modern Physics. University of California Press. p. 248. ISBN 978-0-520-03478-5. ^ Baigrie, Brian (2007). Electricity and magnetism: A historical perspective. Westport, CT: Greenwood Press. p. 35. ^ Roller, Duane; Roller, D.H.D. (1954). The development of the concept of electric charge: Electricity from the Greeks to Coulomb. Cambridge, MA: Harvard University Press. p. 40. ^ Heilbron, J.L. (1979). Electricity in the 17th and 18th Centuries: A Study of Early Modern Physics. University of California Press. pp. 280–289. ISBN 978-0-520-03478-5. ^ Roald K. Wangsness (1986) Electromagnetic Fields (2nd Ed.). Wiley. ISBN 0-471-81186-6. ^ Heilbron, John (2003). 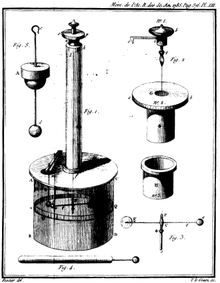 "Leyden jar and electrophore". In Heilbron, John (ed.). The Oxford Companion to the History of Modern Science. New York: Oxford University Press. p. 459. ISBN 9780195112290. ^ a b Baigrie, Brian (2007). Electricity and magnetism: A historical perspective. Westport, CT: Greenwood Press. p. 38. ^ Guarnieri, Massimo (2014). "Electricity in the Age of Enligtenment". IEEE Industrial Electronics Magazine. 8 (3): 61. doi:10.1109/MIE.2014.2335431. ^ Tricker, R.A.R (1965). Early electrodynamics: The first law of circulation. Oxford: Pergamon. p. 2. ISBN 9781483185361. ^ Denker, John (2007). "One Kind of Charge". www.av8n.com/physics. Archived from the original on 2016-02-05. ^ Zangwill, Andrew (2013). Modern Electrodynamics. Cambridge University Press. p. 31. ISBN 978-0-521-89697-9. ^ Jefimenko, O.D. (1999). "Relativistic invariance of electric charge" (PDF). Zeitschrift für Naturforschung A. 54 (10–11): 637–644. Bibcode:1999ZNatA..54..637J. doi:10.1515/zna-1999-10-1113. Retrieved 11 April 2018. ^ "How can we prove charge invariance under Lorentz Transformation?". physics.stackexchange.com. Retrieved 2018-03-27. ^ Singal, A.K. (1992). "On the charge invariance and relativistic electric fields from a steady conduction current". Physics Letters A. 162 (2): 91–95. Bibcode:1992PhLA..162...91S. doi:10.1016/0375-9601(92)90982-R. ISSN 0375-9601.